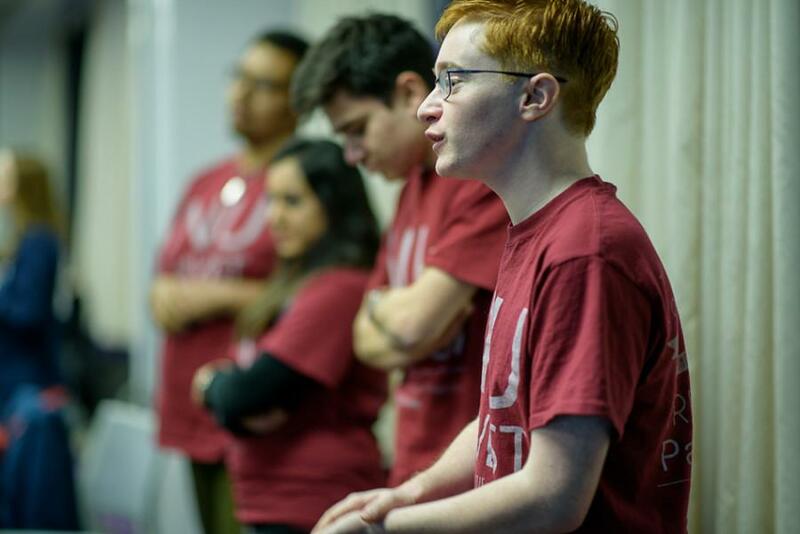 Noah Whinston speaks alongside other Northwestern Divest members during a Senate meeting in February. Whinston, who would have been a Weinberg senior this fall, dropped out of NU to take a job in Los Angeles, vacating his position as ASG speaker. Associated Student Government continues its push for socially responsible investing, drafting a charter for a proposed committee that would oversee how Northwestern handles its endowment. ASG President Noah Star said reforming the University’s investment practices will remain a priority even as former speaker Noah Whinston, who helped push Northwestern Divest’s resolution through Senate last February, prepares to leave campus to take a job in Los Angeles. Star said he will work with Will McLean, the University’s chief investment officer, in the coming weeks to finalize the charter. McLean, who heads NU’s investment office, said in April that he is open to the possibility of such a committee. Star said the committee’s power will depend on where it is located institutionally. Optimally, he said, the committee would operate underneath the Board of Trustees, which would give committee members the fullest access to information about investments. The committee could also exist within the President’s Office or ASG itself, Star said, but that would limit its ability to oversee how the University’s investment staff handles the $9.7 billion endowment. In February, NUDivest introduced a resolution to Senate that asked the University to divest from six corporations the authors say violate Palestinian human rights. More broadly, the resolution also called on ASG to “work to achieve greater transparency in university investments.” After a heated five-hour debate, the resolution narrowly passed Senate on Feb. 19. Whinston, who would have been a Weinberg senior this fall, told senators on Wednesday he dropped out of NU to take a job in Los Angeles, vacating his position as speaker in the process. As in the nation’s capital, the speaker’s unexpected departure will launch a wide-open race to succeed him. Star said the body will elect a new speaker at its meeting Oct. 21. Weinberg senior Matt Clarkston, who served as parliamentarian during Whinston’s tenure, will preside over Senate until a permanent speaker is elected. Clarkston may serve after that, too. “I plan on running,” he told The Daily. As for Whinston, he will take a job as the CEO of Immortals LLC, a professional gaming franchise funded by venture capitalists that he helped line up. Investors include Steve Kaplan — a co-owner of the Memphis Grizzlies — and alternative-rock band Linkin Park.